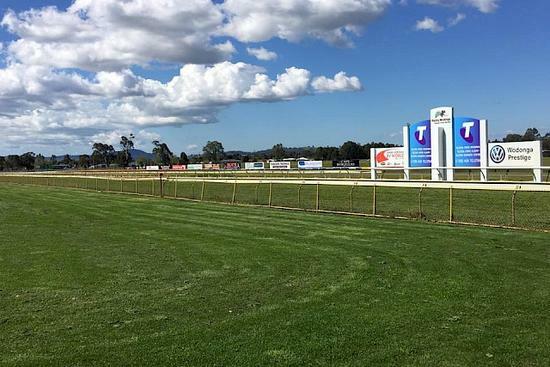 Sunday Country racing will be held at Wodonga & District Turf Club on August 12 with overcast conditions currently supplying a track rating of the heavy 10 for the 8 event card. Race 1 will see a three-year-old maiden plate over 1100 m with Miss Warny having the first of her career starts with Nick Souquet to ride jumping from barrier 10 with a field of 12 to run. Miss Warny is a three-year-old Bay Filly by Epaulette out of the dam Tweet at her first appearance she had a barrier trial at Wodonga over 800 m on a soft six finishing second of four with Nick Souquet aboard arriving two lengths behind Coontara. Race 4 will see Baby Jack compete in a BM64 handicap over 2050 m with Nick Souquet to ride jumping from barrier 4 with a current field of 11 to run. Baby Jack is an eight-year-old Brown gelding having won on five occasions & placed 10 times from 41 starts pocketing connections $106,000+ in prizemoney, at his last outing he finished runner-up of 12, over 2100m when steered by Nick Souquet arrived at odds to finish 0.65 lengths behind Sir Ottavio in a class record time of 2:07.01. The final stable runner is a dual nominator at Wodonga and Wagga and looks likely to compete here in a BM 58 handicap over 1400 m with Michael Poy reducing 2 kg off the 62 kg allotted from barrier (9). Father Brown is a four-year-old Bay gelding & is a winner of one from three, last start at Sandown Hillside he finished 12th of 15 under Ms Nikita Beriman over 1300 m when arriving 10.40 lengths behind Holy Command on that occasion. Craig has made a gear change for this outing with a tongue tie off first time & Winkers have been added.